대방광불화엄경은 줄여서 ‘화엄경’이라고 부르기도 하며, 부처와 중생이 둘이 아니라 하나라는 것을 기본사상으로 하고 있다. 화엄종의 근본경전으로 법화경과 함께 한국 불교사상 확립에 크게 영향을 끼친 경전이다. 이 책은 당나라 징관(澄觀)의『화엄경소』120권을 송나라 정원(淨源)이 해설하여 쓴 것 가운데 제84·100·117권의 3권 3첩(帖)이다. 병풍처럼 펼쳐서 볼 수 있는 형태이며, 크기는 세로 32.2㎝, 가로 10.7㎝이다. 이 책은 고려시대 대각국사 의천과 친교가 있던 정원이 해설하여 새긴 목판본을 중국 송나라에서 보내와서 그것으로 인쇄한 것이며, 조선 세종 5년(1423)에 대장경판을 달라는 일본의 요구에 따라 이 목판을 보냈다는 기록이 있다. 당시 삼국의 불교를 통한 문화 교류를 알 수 있는 산 증거물로서 귀중한 자료이며, 지금까지 나온 판본 가운데 가장 깨끗하고 인쇄나 제본 상태도 훌륭하다. 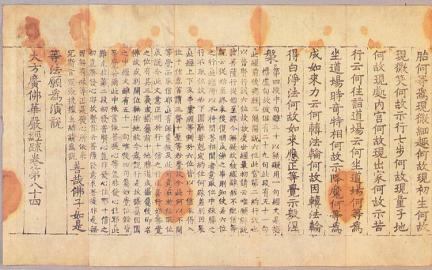 Avatamsaka Sutra is one of the canonical scriptures of Mahayana Buddhism; the central idea expressed in this sutra is the unity of Buddha and sentient beings. 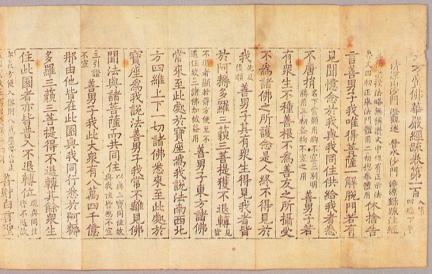 As the most fundamental text for Korean Buddhism, this sutra has had seminal influence on Korean Buddhist philosophy along with the Saddharmapundarika Sutra (Lotus Sutra). 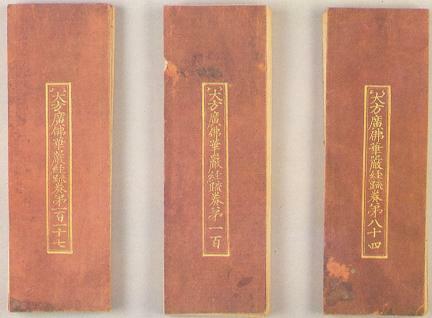 These three volumes are from the 120 volumes of the Commentary on the Avatamsaka Sutra (Flower Garland Sutra), which was written by Chengguan of the Tang Dynasty and annotated by Jing Yuan of the Song Dynasty. They were made in the form of a folding screen measuring 10.7 cm wide and 32.2 cm long. The original woodblocks made in the Song Dynasty were sent by Jing Yuan to State Preceptor Daegak in order to publish this book. 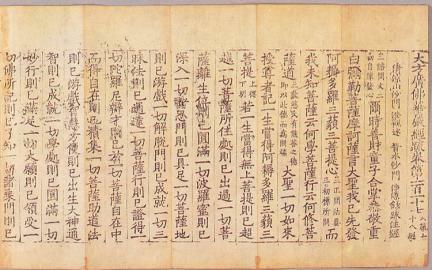 Later, the woodblocks were given to Japan, which had made numerous requests for a set of Tripitaka Koreana woodblocks, in 1423 (fifth year of the reign of King Sejong of the Joseon Dynasty). These volumes hold great significance in the history of Buddhist exchanges between China, Korea, and Japan and show the most well-preserved and excellent printing and binding conditions among similar books discovered so far.